You'll see my Prius all around Hampton Roads! Does your organization or property need Geese Relief? We have over 10 years experience and proven results in helping Government Agencies, Hospitals, Property Managers, Homeowners Associations, Golf Courses and Sports Fields to help safely relocate Geese and eliminate the problems they can create. The concept is very simple, but the skills required for successful results come from years of working with Canada geese and understanding the love of nature. Rose, on the right looking out over a pond is making sure the geese fly off. Locations like this one have been completely taken over by “Resident geese” (no longer referred to as Canada geese). These birds have amazing adaptability skills and instinctly choose to live near where they hatched and return there once they find a mate to start the cycle of life all over again. Our job is to convince the geese to nest in remote areas away from harm and conflict. This site is now clear of geese and the bacteria-laden droppings that they leave behind. Everyone wins!! 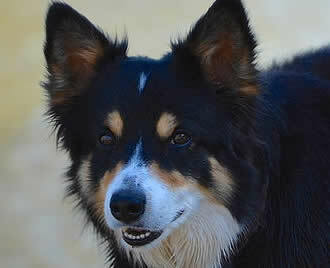 Border Collies have been known for many years as the smartest breed of dogs on the planet. Sheep ranchers have utilized their skills for decades. Their close resemblace to wolf-like stances, stares and walk intimidate not only sheep but most any other animal that fears a predator like a wolf.